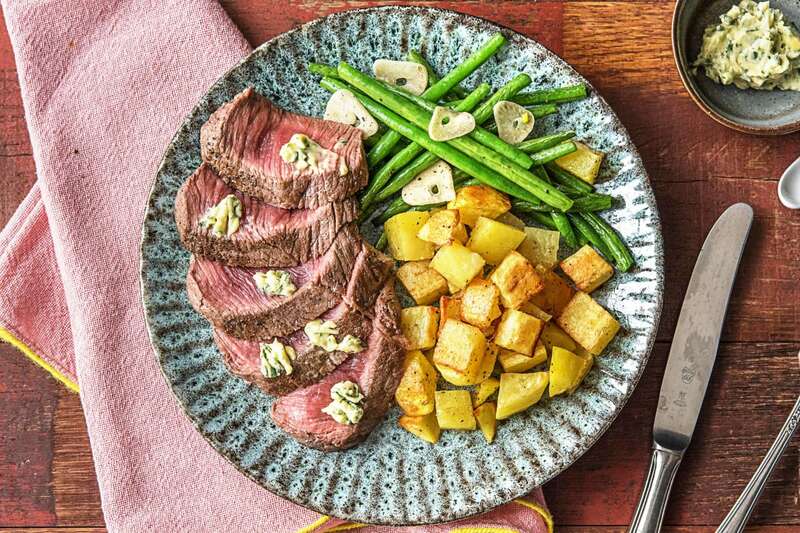 This week’s entry into the HelloFresh Hall of Fame is an all-time favorite thanks to the compound butter—that’s soft butter mixed with herbs and seasonings. For chefs, this ingredient is the ultimate secret weapon because it’s just about the easiest and most instantaneous way to sauce a dish. 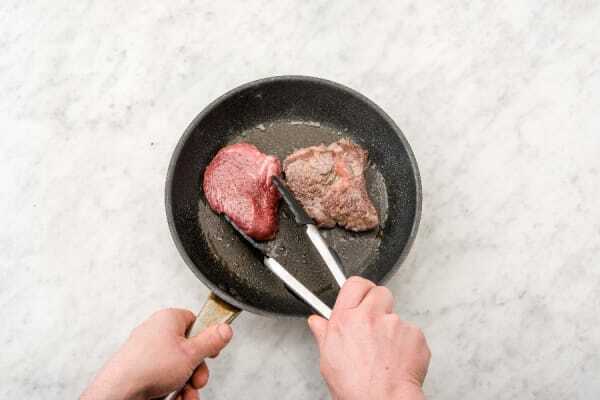 Here, it’s dabbed onto steak for an intensely rich effect. But we think you might find yourself adding it to everything once you see how it rewards with simple deliciousness. Wash and dry all produce. Preheat oven to 425 degrees. 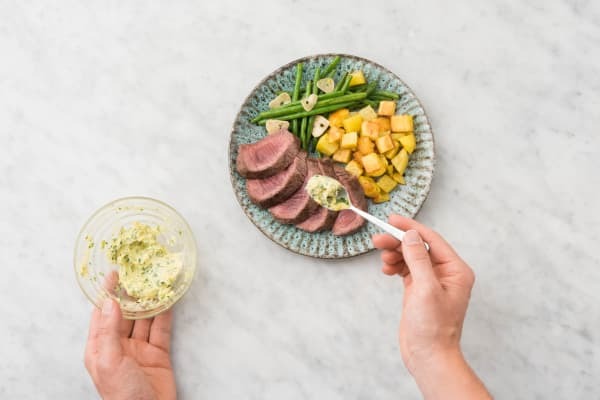 Take out 1 TBSP butter and steak and let sit at room temperature. 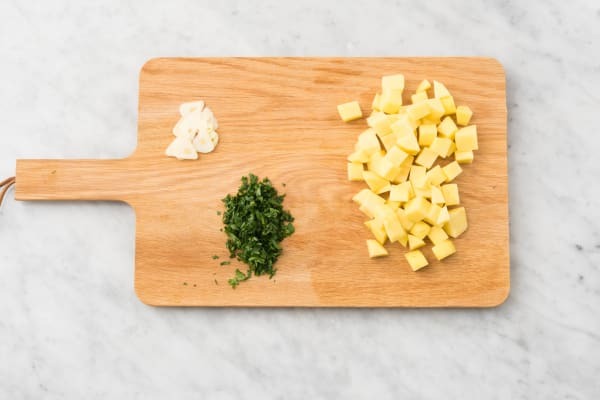 Peel potatoes, then cut into ½-inch cubes. Thinly slice garlic. Finely chop parsley. 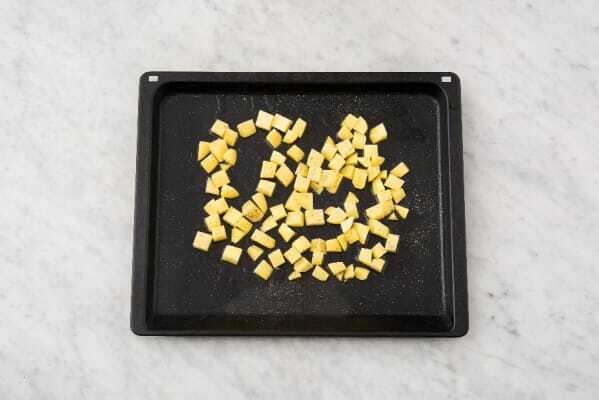 Toss potatoes on a baking sheet with a drizzle of oil and a pinch of salt and pepper. Roast in oven until browned and tender, 20-25 minutes total (we’ll be adding more items to the sheet before the potatoes are done). Heat a drizzle of oil in a large pan over medium-high heat. Pat steak dry with a paper towel. Add to pan and cook until browned on surface, 2-3 minutes per side. Transfer to baking sheet with potatoes. Roast to desired doneness, 5-7 minutes. Remove from sheet and let rest 5 minutes. Meanwhile, heat a drizzle of oil in same pan over medium heat. Add green beans and cook, tossing, until tender but still a little crisp, 4-5 minutes. Add garlic and cook until fragrant, about 30 seconds. Season with salt and pepper. 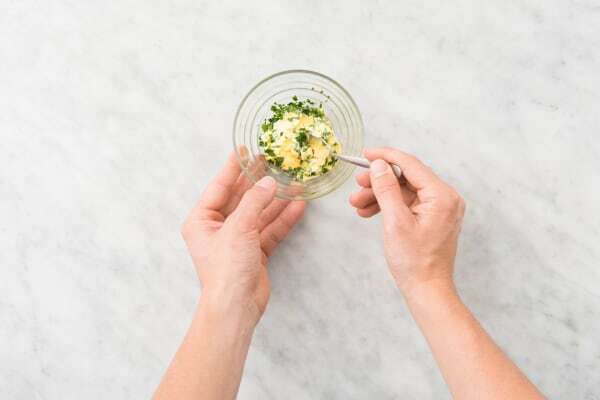 In a small bowl, mix butter, 1 tsp Dijon mustard (we sent more), and a pinch of parsley. Season with salt and pepper. Slice steak against the grain. Top with herb butter. 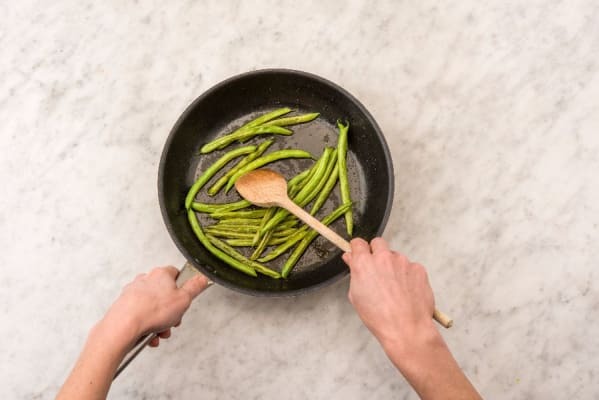 Serve with green beans and potatoes on the side. Garnish with any remaining parsley.